In this is an 8 hour, one of a kind, hands-on course you will learn to make Sicilian, Grandma, Detroit, & New York Pizzas. You will also learn the fundamental techniques of pushing pan pizzas, making dough & starters, making tomato sauce, making agave pesto, making Sweet Italian Fennel Sausage, and stretching and shaping your dough, as well as how to troubleshoot problems and oven skills. You’ll walk away with the knowledge and confidence to build upon what you have learned. Tony Gemignani is the chef and owner of twenty-one locations in Northern California and Las Vegas: Tony’s Pizza Napoletana, Capo’s, Giovanni Italian Specialties, Tony’s Coal-Fired Pizza, three Slice Houses by Tony Gemignani, all in San Francisco; Pizza Rock in Sacramento and Las Vegas; and Tony’s of North Beach and Slice House by Tony Gemignani in Rohnert Park and Las Vegas. 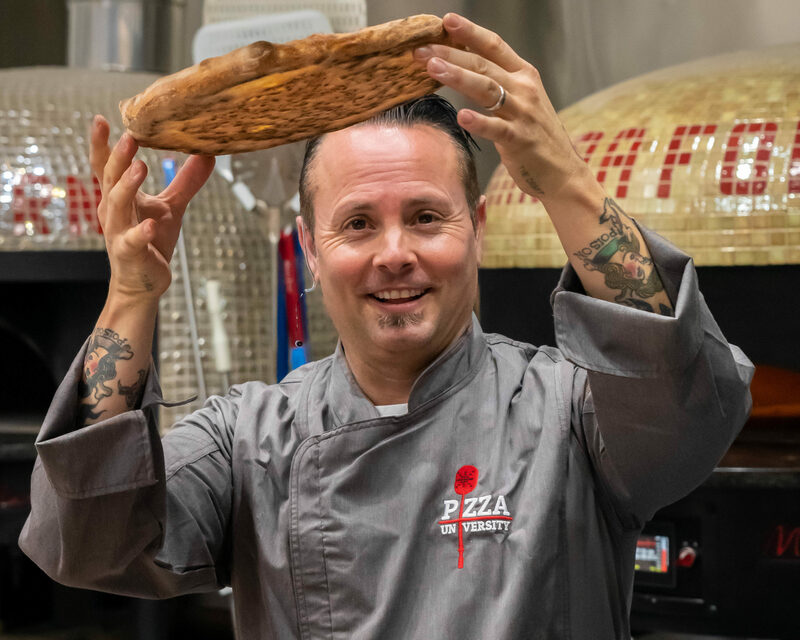 A 12-time World Pizza Champion, Tony has been perfecting his craft for more than two decades and holds an impressive set of awards for his pizza making and tossing skills. He is the proprietor of the International School of Pizza in San Francisco, where he certifies chefs from around the world, and is an official U.S. Ambassador of Neapolitan Pizza by the city of Naples, a prestigious title only given to three people in the entire world. Tony has appeared on a number of popular shows including “Good Morning America”, “The Today Show”, “The Tonight Show with Jay Leno”, and is a regular on Food Network. He even took home the gold medal at the Food Network Pizza Champions Challenge. He is the author of PIZZA, Tony and the Pizza Champions, and most recently, The Pizza Bible, the definitive book on pizza. He has been inducted into the Guinness World Book of Records four times.